The name opal is thought to have originated from the Sanskrit upala, meaning precious stone and then the Greek word opallios, which meant to see a change of color. 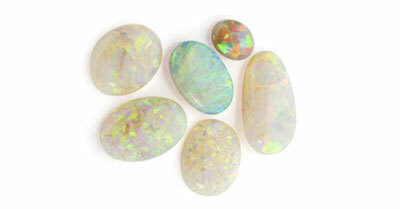 Opal is a form of silica with hydration. Its water content can range from 3 to 21% but is usually 6 to 10%. It is most commonly found in rock fissures along with limonite, sandstone, rhyolite, marl, and basalt. Australia is the largest producer of opal producing 95 to 97% of the world's market with 80% coming South Australia. 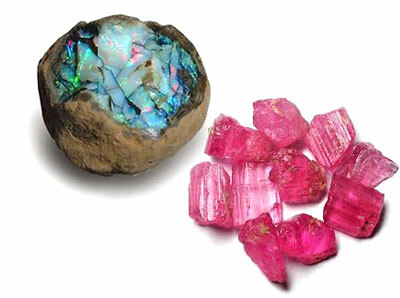 Ethiopia produces a large supply but is measured in weight, were as opal from Australia is measured in dollars. Because the units of measurement are different, it is impossible to directly compare the two. Opal is alson mined in Mexico, Brazil, Honduras, Ethiopia, the Czech Republic and parts of the U.S., including Nevada and Idaho. For most of opal's written history, it was a gem of good luck, however during some periods of its lifespan it was said to bring bad luck. When jewelers first started working with opal, they did not understand the properties of the gem and it would dry up and crack during cutting, polishing and mounting. Of course they just saw this as the stone bringing bad luck. Then in 1829 Sir Walter Scott wrote the bestselling novel Anne of Geuerstein. Lady Hermione was a character who was an enchanted princess of sorts and always wore a dazzling opal in her hair. 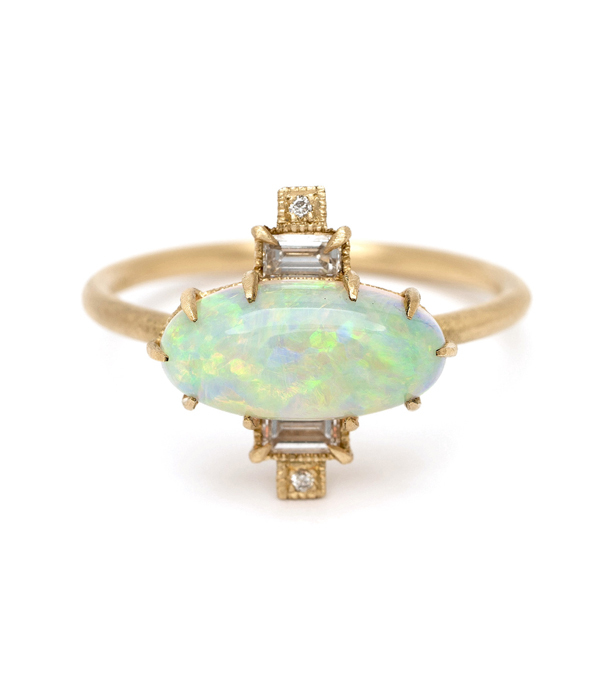 In the story, a few drops of holy water were sprinkled on the opal and its radiance disappeared. Then next day all that remained of Lady Hermione and her opal were a pile of ashes in the bed. The popularity of this novel destroyed the European opal market for 50 years with no real merit of opal's bad luck. Fortunately in 1877, an amazing black opal was found in South Wales, Australia, and the opal market was finally revived. Opal is now known to amplify traits, good or bad. It is also said to stimulate originality and creativity as well as bring about loyalty and faithfullness the wearer. Opal is also the national gemstone of Australia. 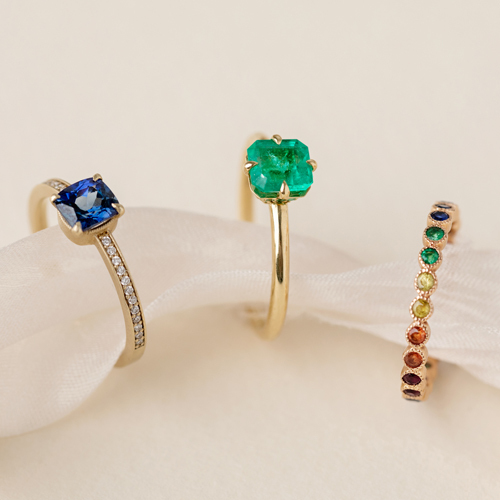 The name tourmaline comes from the Sinhalese term turmali mali, which means stone of mixed colors. This name was given to all gemstones coming from the Island of Sri Lanka at the time. This indicates the inability to distinguish differences between stones during that time period. 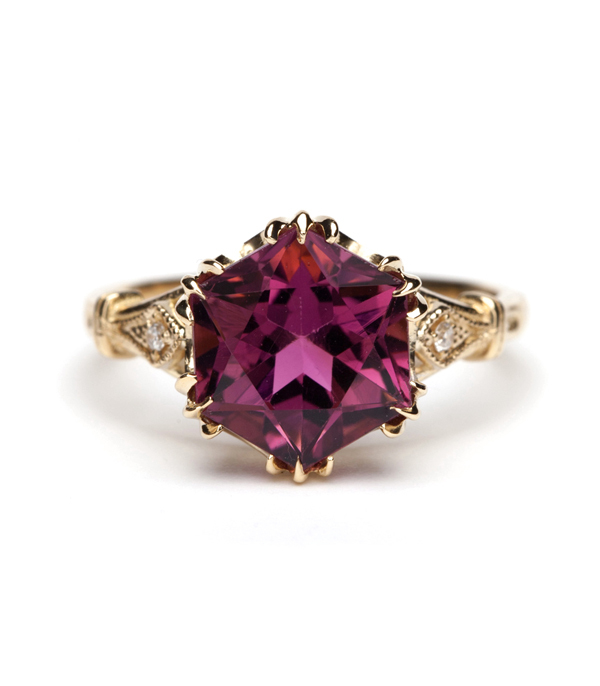 In fact, for a time, pink and red tourmaline were thought to be rubies. Tourmaline is a crystalline boron silicate mineral compounded with elements such as aluminium, iron, magnesium, sodium, lithium, or potassium and comes in a wide variety of colors. Tourmaline is chemically one of the most complicated groups of silicate minerals. The most common species of tourmaline, about 95% in nature, is black tourmaline or schorl, named after the German (Saxon) village where it was first found. Tourmaline is found in granite and marble. Gem quality tourmaline is mined mostly from Brazil and Africa, but also mined in Tanzania, Nigeria, Kenya, Madagascar, Mozambique, Namibia, Afghanistan, Pakistan, Sri Lanka, Malawi and the United States. The tourmaline is a receptive stone, which means it is soothing, calming and promotes spirituality, wisdom, mysticism and meditation. It creates peace and helps to comunicate between the conscious and unconscious realms expanding psychic awareness. It is also said to radiate energy that attracts money, healing and friendship as well as promote compassion and help the wearer keep a cool head.